We combine the skills of our patent attorneys with those of our intellectual property lawyers and trademark attorneys, who are all well versed and experienced in obtaining, protecting and enforcing intellectual property rights. This allows us to offer comprehensive intellectual property services and help you protect intellectual property rights pertaining to your new ideas, including patents, copyrights, industrial design rights and trademarks. If you are not familiar with intellectual property protection, please consult with a representative of our firm. We conduct a broad range of patent searches and provide expert support and legal advice backed up by in-depth experience to protect your new creations and innovations in Japan and abroad. If you have developed new ideas, products and services, we will analyze your idea and help you determine whether it is worth protecting as a patent or a utility model. We prepare patent specifications, file patent applications, and correspond with patent offices of various jurisdictions around the world. The first-to-file system is used in all countries including Japan. In the first-to-file system, once you have submitted an application, it would be very difficult to change it or add new materials. Therefore, it is important to take into account future patent enforcement when filing an application. Due to our extensive experience in post-grant proceedings we are able to provide you with informed advice and guidance in preparing a strong provisional patent application taking post-grant enforcement into account. We invite you to contact us if you have specific issues with the Japan Patent Office. We have extensive experience in handling complex patent office proceedings. We can help you secure your patent rights by responding to an Office Action such as a notice of reasons for rejection or a final rejection or handling presentation of information by a third party that could potentially prevent you from receiving full patent rights. Before rushing into sending an infringement warning letter or notification to a potential infringer or simply stopping your alleged infringing conduct in response to a warning letter, we advise you to consider whether the potential infringer’s actions or your own actually constitute an act of infringement. We have extensive experience in handling patent infringement issues. Our highly experienced and dedicated patent attorneys and attorneys-at-law help you solve problems, handling both the technical and legal aspects of a case. If you suspect that someone is infringing your patent rights, contact us. We can seek an injunction preventing the infringer from continuing to exploit the invention claimed in your patent, seek monetary damages in the form of lost profits or royalties and take measures to make your patent rights stronger and less vulnerable. For more information about intellectual property disputes and litigation, see Services: Intellectual Property. When expanding into global trade, it is essential to take steps to prevent piracy, counterfeiting and unlawful copying by protecting your copyrights and patents overseas. To seek patent protection abroad, it is necessary to file a patent application in accordance with the Paris Convention for the Protection of Industrial Property and file international applications using the PCT (Patent Cooperation Treaty) within a certain period following the filing of your application in Japan. Our patent attorneys and intellectual property lawyers, well-versed in overseas legal and patent systems have decades of experience working with and retaining close relationships with overseas associates. We secure and maintain patent rights overseas and protect your patents against counterfeiting, piracy or infringement. For more information about resolution of IP disputes in collaboration with our overseas associates, see Services: Cross-border Practices. A patent is an exclusive right granted for an invention, which meets certain conditions such as industrial applicability, novelty, inventive-step, etc. 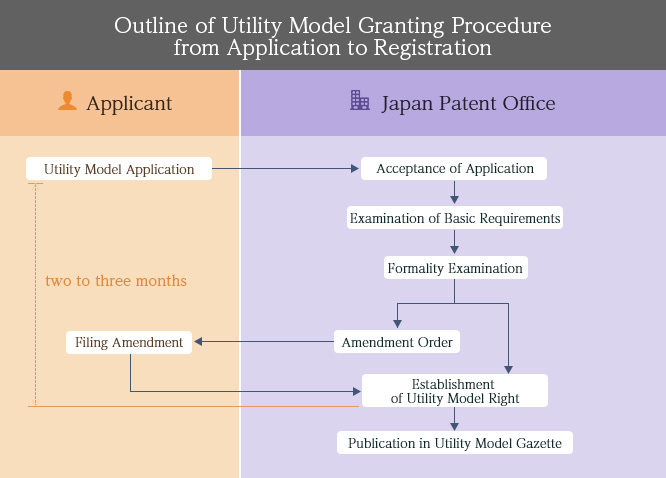 The requirements for acquiring a utility model are less stringent than for patents. Although a utility model also has to meet the requirement of novelty, the requirement of inventive-step may be less onerous. Yuasa and Hara handles biotechnology inventions, medical-related inventions including medical imaging devices such as CT and MRI, software-related inventions including computers and games and a variety of advanced technologies such as mechatronics, robots, and carbon nanotubes. We also handle cases focused on improving people’s lives. We believe that it is our professional responsibility to contribute to the development of society, especially by assisting the disabled, elderly and other vulnerable members of society through improvement of technologies. An invention can be patented if it meets the relevant conditions such as industrial applicability, novelty, inventive-step or the like and an official examination is performed to judge patentability of the invention. 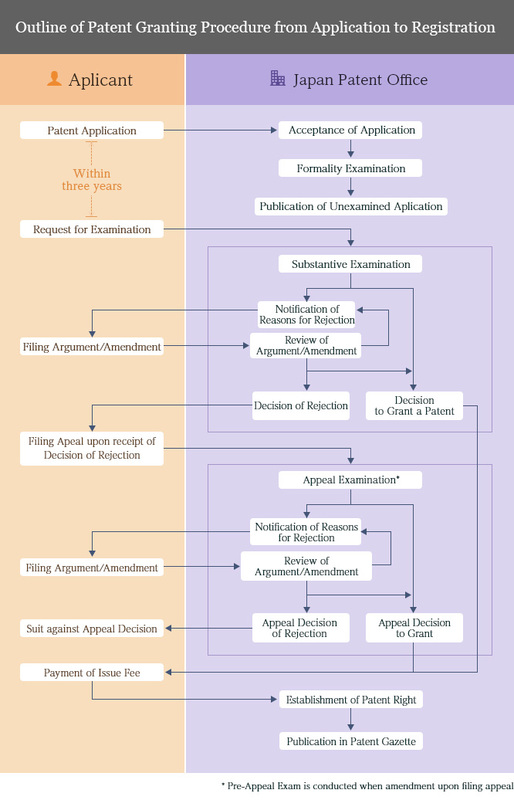 A patent examiner issues an Office Action in response to a patent application and gives reasons why the examiner allows or rejects the application. If it is rejected, the applicant is entitled to reply to the rejection and request reconsideration or further examination by filing an argument or making an amendment. A utility model is granted without conducting substantive examination in terms of novelty or inventive-step. If a patent is issued and a third party utilizes the invention claimed in the patent without the permission of the patent owner, the patent owner may seek an injunction prohibiting infringement of their patent. If a utility model is registered and a third party utilizes the registered model without the permission of the owner of the utility model, the owner may file an application for an injunction.However, as a utility model is not subject to substantive examination, the proprietor of the utility model is required to obtain a utility model technical evaluation as to novelty, inventive-step or the like from the Patent Office Commissioner and submit the technical evaluation report when seeking an injunction or damages. Granting and enforcement of patent rights and utility model rights is governed by national or regional laws.Basically, a patent is useful for protecting an invention only in the country where the patent is granted. When exporting products to another country or providing services or licensing your invention in another country, you must obtain patent protection by establishing a patent right in that country.